When I was a little girl, I was always fascinated with ballet. I remember having this adorable pink ballet slipper wall decor hanging in my bedroom that I would stare at and dream. In my young mind, ballet was the complete and total definition of glamour. The frilly tutus, the beautiful makeup, the graceful moves... I was intrigued. Though my family never had the money for lessons, I found myself reading books on the topic and attempting to learn what the various positions were, what all the terms meant and basically just soaking anything in I could. But mostly, I would just dream about the glamorous world of ballet. From the very first pages I found myself being brought back to those childhood fantasy days. 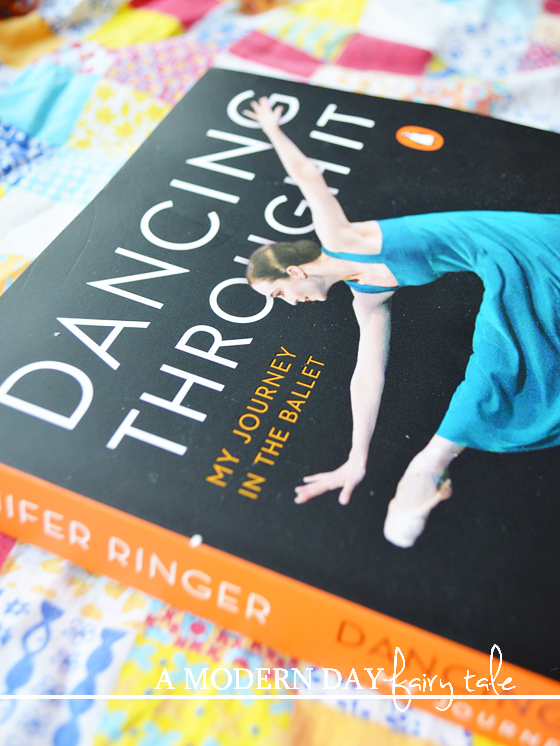 Jenifer spoke of ballet with such a fondness and naturalness that I could not help but be drawn into this world. Early on, I found myself thinking, 'Dancing through...what?' It seemed that ballet in many ways came very naturally... though she worked hard always, of course, I wasn't seeing much TRUE struggle. But that changed when Jenifer was a teenager and a struggle that is all too common in the world of ballet reared its head- issues with body image and disordered eating. While anorexia is probably most often thought of when associated with ballet, for her it was a back and forth struggle between under and overeating. Weight issues are a funny thing, aren't they? No, not funny haha, but funny in that there are so many contradictions. I've always been exceptionally thin myself. In my freshman year of high school, I (naturally) weighed a mere 87 pounds. On one hand I would have people who worried about me and telling me I was much too thin (and given supplements to try to gain weight)... and on the other I would have other girls coming to me and praising my size with comments like, 'Oh, you're so thin! I would kill to have your body'. It was very confusing... how could I be both too thin and just perfect? And I was not in a world where body truly mattered... a world like ballet! 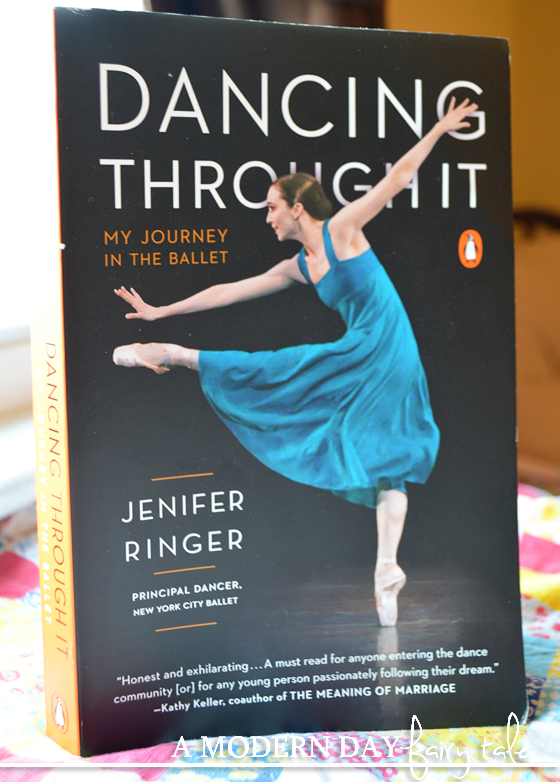 In Dancing Through It, Jenifer shared her very personal struggle with overeating, and how the resulting weight gain led her to be fired from the ballet. But she also shared how during her time away, she turned to God and was able to overcome her issues and ultimately return to and fall back in love with dance. Later on, this struggle even led her to help touch lives of young girls everywhere during a very public attack on her weight from a critic. The world of a ballet dancer is one that is entirely different than what most of us can relate to, but in many ways this story is universal. Weight issues are not exclusive to performers. It is something we see among girls in all walks of lives. (Boys too, of course!) But aside from issues of weight, we are also faced with other struggles- depression, anxiety, job loss, sickness. Jenifer's story is not just a story of a dancer... but the story of a person who turned to God in her time of crisis and came out on the other side. It is also a story of God using that struggle to create something beautiful. So, whether you have interest in ballet or you don't, this is a universal story that we can all take away from. Dancing Through It is available now to purchase at Family Christian. My kids LOVE Veggie Tales - I'd love to get the new DVD, Noah's Ark, for them.